The effects of Weapons of Mass Destruction (WMDs) consisting all the destructive means like Nuclear, chemical and biological and their disastrous consequences persist for centuries, especially the radiation and other hazardous effects endure in the atmosphere affecting many other in the neighbouring regions. Moreover, a strapping reality also prevails about the lesser chances of their usage as those being merely for deterrence purposes, therefore, for many experts, the conventional weapons would again become a preference of many great powers in the coming future. In certain circumstances when the military apparatus becomes a pertinent means of protecting the vital national interest, the conventional means only turn out to be the ultimate option because WMDs mostly serves tactical purposes of deterring the enemy and controlling its actions to prevent it from any possible aggression. Any use of WMDs will only mean falling into a situation of catastrophic destruction because in such wars, neither side will be victorious. At present, the conventional military supremacy has become penchant move of many nuclear powers, since they realize the fact that their nuclear weapons only serve a political goal and a long-term pursuance of such goals will cost as a huge burden on their economy however, except as a means of last resort, the nuclear weapons have no valid or persuasive military role. For non-nuclear weapon states, the conventional military balance has a varying role in the strategic scenarios, especially in the conflict-ridden regions given the fact; any imbalance in the equilibrium could destabilize the strategic stability and trigger an arms race where each side will try to maximize its power even not ignoring the option of acquiring WMDs likewise, the conventional military balance also puts states in an extremely difficult situation where each side is eventually compelled to maintain the status-quo and such marvels of attaining the edge in military assets can also prove to be a costly deal, whereas, any discrepancy in the balance of power, a number of concerns will arise; indulging two sides in an unanticipated arms race like in the case of many African states but such arms races are very limited in their scope and would not endanger global peace and security at large. The conventional types of warfare with unadventurous weapons in the battleground are aimed only targeting opponent’s side without causing colossal destruction. Of course, when the conventional balance of power gets undermined, it will definitely, pave the way for the struggle to acquire nuclear weapons. For example, in South Asian case, the failure of conventional power equilibrium resulted into the development of nuclear weapon and interminable ballistic missile race jeopardizing the regional and global peace. Initially in the post-partition era, Pakistan had passed through serious threats to its survival and was deprived of its due share in financial assets and military equipment. The unfavorable circumstances prevailed and by the next year of their independence both India and Pakistan fought a war in 1948. For Pakistan it became an issue of its existence, therefore, it had to look for a variety of options to safeguard its security, interestingly, after the partition all ordnance factories had also fallen to the Indian side, whereas the weak economic conditions of Pakistan were also not in favour of importing military equipment. This was a time when Pakistan experienced a two-prong dilemma i.e. to ensure its survival and become self-sufficient with lesser means. Keeping in view such challenges Pakistan also joined the SEATO and CENTO in 1954 and 1955 respectively, but all in vain and failed to rescue it during the war and crises time. Ultimately, the country focused more towards the self-reliance programs and the continuing efforts, especially during the last three decades, Pakistan today is successfully standing in the row of the countries that possess highly sophisticated military technology like advanced versions of missiles, tanks, aircrafts, drones etc. India due to its huge investments in conventional military arsenals has a hefty military supremacy over Pakistan. 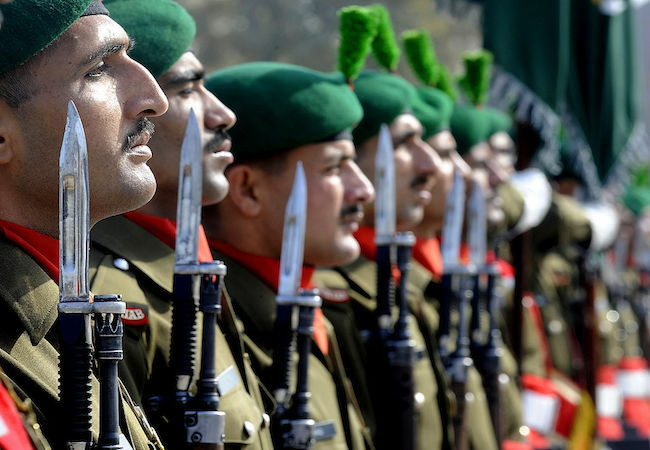 Pakistan’s defence spending is only Rs700.2 billion for the 2014-15 fiscal years, whereas, the Indian defence budget by 12% addition with last year’s defence budget has now become Rs. 2.29 trillion. The future has rightly been projected by the Britain’s ministry of defence that by 2045, India will probably become third largest global conventional military arsenal with an estimated expenditure exceeding 654 billion US dollars on its defence sector. However, the modern Revolution in Military Affairs (RMA) has further convoluted the future of the conventional weapons involving new doctrines, strategies, tactics and technologies and ascendancy of quality over the quantity leading towards an irrevocable change in the conduct of warfare and the transformation of military equipment by involving fully automated unmanned machines in the battleground and the command line monitoring all the maneuverability through real-time satellite and space technology controls.